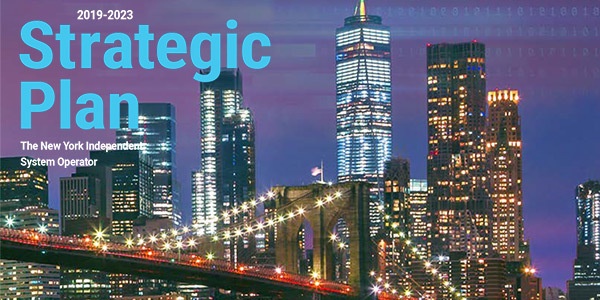 NYISO on Tuesday released a Strategic Plan outlining how it will incorporate market and regulatory trends into its planning processes for 2019 to 2023. The document identifies key strategic initiatives in addition to the ISO’s core responsibilities and ongoing project plans. To address its changing resource mix, NYISO said it will review market products and operational and planning practices. Taking “a deeper dive into evolving focus areas” will require significant study work, it says. New York’s Clean Energy Standard and other policy initiatives, such as Reforming the Energy Vision, are ramping up adoption of renewable and distributed energy resources, creating a need to balance intermittent generation with other resources such as storage. “Incenting resource flexibility, which includes the ability to respond rapidly to dynamic system conditions, providing controllable ramp with fast response rates and providing frequent start-up/shutdown capability, will be key to future market enhancements,” the plan says. Concern about natural gas infrastructure is a leading theme of NYISO’s 2015-2019 Strategic Plan, released Thursday. FERC approved NYISO's proposed locality exchange factor for its capacity market. FERC approved NYISO’s tariff revisions to implement a new reliability-must-run program but directed further revisions.